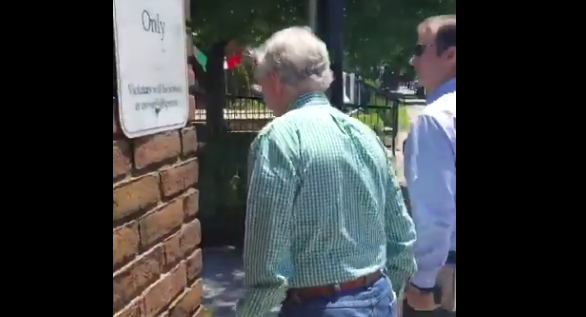 McConnell Confronted By Anti-ICE Protesters [VIDEO] - Joe.My.God. The interaction was captured on video and shared with Courier Journal. In it, someone asks McConnell, “Where are the children? Where are the babies, MItch?” — an apparent reference to the separation of children from families at the southern U.S. border. “What are you doing to get the babies back?” someone asks in the clip. McConnell, wearing a green shirt tucked into blue jeans, isn’t shown reacting or responding to the protesters. He walks past a sign for Bristol Bar & Grille, turns a corner and gets into a vehicle.